These are the best venison brats; your family will flip when they taste them. A delicious spice blend including many variety mixtures to call your own. This homemade venison bratwurst recipe from scratch means no chemicals or preservatives. 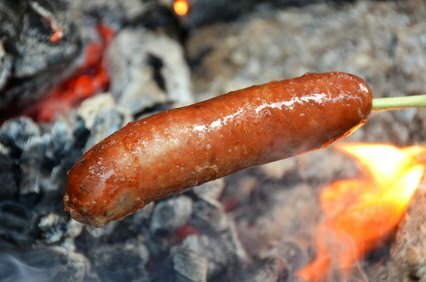 Light up that grill, roast them over a fire, or in the winter you may pan fry these juicy homemade brats. I've also included my homemade mustard, ketchup and relish recipes below. My mouth is watering thinking about these beer brats. I also placed a link below on how to make homemade sauerkraut. So good. I also like to slice up leftover brats and make fried potatoes. Add the brats towards the end of cooking to heat them up. Good in buttered noodles or on top of mashed potatoes. Mix the ingredients together and put mixture in food grinder. Turn the grinder on and hold the casing. The casing will fill with air – then squeeze the air out of the casing and tie a knot on the end. Now you can boil them in beer or water, or grill them for 20 to 30 minutes. **After soaking, rinse thoroughly by placing the end of the casing opening over the water faucet and rinse it that way. You can try variations, use wine or milk instead of the beer. Add one cup sharp cheddar cheese, and chopped jalapeno peppers and horse radish in one batch. Or you can make a large 20 or 30 pound base recipe and divide it up to make many different varieties at once. Your friends and family will be begging you to do this. Seriously. You may also enjoy potato chips or make seasoned French fries and dunk these puppies in homemade ranch dressing. Yum.